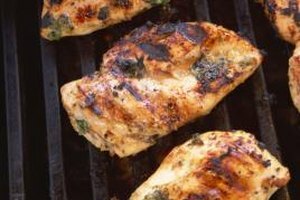 The high heat of the grill helps seal in a chicken's juices. At first flush, the techniques you'd use for grilling and blackening meat might seem similar. 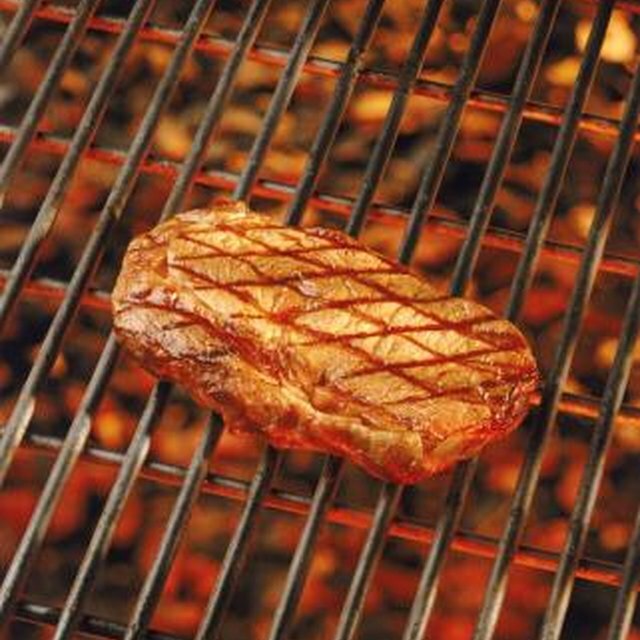 Both methods use dry heat to add flavor to meat while sealing in the juices. But while blackening always involves a seasoning mix and intentionally flirts with the line between burned meat and meat that is simply done, grilling takes a more leisurely approach to cooking food. Whether you use a hibachi, a gas grill or cook over wood, grilling relies on dry heat and any mixture of spices to cook meat or vegetables. With the meat resting on a grill or a grate during cooking, no oil is needed. A big factor in successful grilling is heating food to 300 to 500 degrees Fahrenheit so the Maillard reaction takes place. Coined by a French chemist of the same name, this reaction is responsible for the browning on meat's surface and the flavor boost that goes with it. Invented by Louisiana’s Chef Paul Prudhomme in the 1980s, blackening food is a two-part process that includes coating meat with butter and a special seasoning mix, then quickly cooking it in a cast-iron pan quickly over extremely high heat. The butter and spices quickly encase the meat, allowing the interior to cook in moist steam. You can buy a blackening mix in the grocery store, but look for one that includes Chef Prudhomme’s basic ingredients of paprika, salt, pepper, onion and garlic powders, cayenne, thyme and oregano. Although meat is typically blackened, inventive cooks have also used the technique with tofu, french fries and vegetables. Whether you marinate meat first, or just toss it on the grate, grilling seals in the juices and changes the flavor. Unlike blackened meat -- which needs to be cut thinly to ensure doneness -- almost any size of meat can be used. Steaks, chops, burgers and whole chickens or turkeys, can be roasted on a grill. All types of rubs and seasoning combinations can be used on grilled meat before roasting. A classic barbecue rub can be made with sugar, salt, cumin, chili powder and cayenne. For an herb-inspired rub, mix together sage, fennel seeds and rosemary. Blackened meat needs a distinct cooking technique and special seasoning rub to get the spicy-sweet, smoky flavor it is known for. Put a cast-iron pan on a burner turned to its highest setting. Once the pan reaches 500 to 600 F -- which takes roughly 10 minutes -- the meat is dipped in melted butter, lightly seasoned with blackening mixture and gingerly placed in the unoiled pan. The ideal meat is only 1/2 to 3/4 inch thick, and cooking takes roughly two minutes per side. It creates a fair amount of smoke in the kitchen and in a quantity that quickly overwhelms a typical kitchen exhaust fan.